The American Waterfront section of Tokyo Disney Sea is quite an extensive and diverse land. Generically themed to the seaports of the United States, it weaves together ambiance from New York, New England, and San Francisco into one charmingly spectacular land with a bundle of attractions. One of the more recent additions (relatively speaking) is Toyville Trolley Park, an expansion next to the Tower of Terror that houses Tokyo's Toy Story Midway Mania. By day, this section of the park is exceedingly busy, with waits often exceeding four hours for a video-based shooting attraction identical to versions in Anaheim and Florida! But by night, after the park is closed, it's a scene of tranquility, reflecting the grandeur and romance of the classic Victorian seaside amusement piers that thrived in the golden age of the early 1900s. If you've ever wondered what places like Coney Island and Luna Park were in their heyday, Toyville Trolley Park imparts a nice idea. 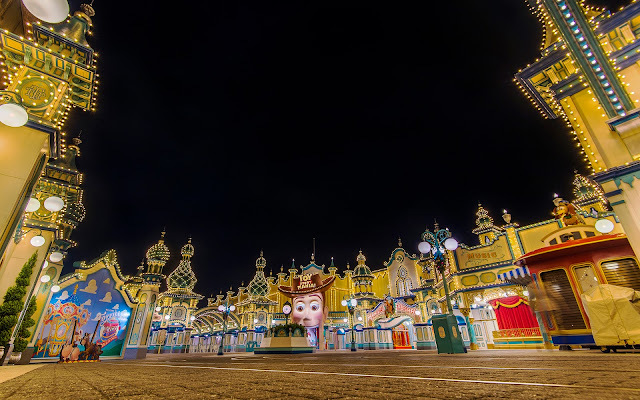 Mark it up as reason #5,291 that Tokyo Disney Sea is the Sea of Dreams! Toy Story Mania is the pinnacle of Tokyo Disney Sea's Toyville Trolley Park, in the American Waterfront section of the park.